The Mitotic Exit Network (MEN) proteins – including the protein kinase Cdc15 and the protein phosphatase Cdc14 – are essential for exit from mitosis in Saccharomyces cerevisiae. To identify downstream targets of the MEN, we sought telophase arrest bypassed (tab) mutations that bypassed the essential requirement for CDC15. Previous studies identified net1 tab2-1 and CDC14 TAB6-1 as mutations in the RENT complex subunits Net1 and Cdc14, respectively, and revealed that the MEN acts by promoting release of Cdc14 from its nucleolar Net1 anchor during anaphase. However, the remaining tab mutants were not characterized. Fourteen out of fifteen tab mutants were mapped to three recessive (tab1-tab3) and three dominant (TAB5-TAB7) linkage groups. We show that net1 tab2-1 enables growth of tem1Δ, cdc15Δ, dbf2Δ dbf20Δ, and mob1Δ, but not cdc5Δ or cdc14Δ, arguing that whereas the essential task of the first four genes is to promote exit from mitosis, CDC5 possesses additional essential function(s). net1 tab2-1 but not CDC14 TAB6-1 resulted in a high rate of chromosome loss, indicating that Net1 promotes accurate chromosome segregation in addition to its multiple known roles. Finally, TAB1 was shown to be MTR10, a gene encoding nuclear transport receptor/adaptor. In some of the tab mutants including mtr10 tab1-1, defective nuclear export of the ribosomal protein Rpl11b was observed. Furthermore, the transport-defective -31 allele of the karyopherin SRP1, but not the transport competent -49 allele, exhibited a tab phenotype. Transport-defective mutations in two karyopherins can bypass cdc15Δ, suggesting that the function of the MEN is to promote mitotic exit by regulating nuclear transport. In S. cerevisiae, a key event accompanying exit from mitosis is the inactivation of Clb/Cdc28 protein kinase achieved through degradation of Clb and accumulation of the Clb/Cdc28 inhibitor Sic1 (reviewed in ). Anaphase-Promoting Complex/Cyclosome (APC/C) ubiquitin ligase and its substrate specific activator Hct1/Cdh1 are required for degradation of Clb2, the major mitotic cyclin in the budding yeast (reviewed in ). Whereas hct1Δ and sic1Δ cells appear relatively normal, hct1Δ sic1Δ cells are inviable, presumably due to their inability to extinguish Cdc28 activity in telophase . The complexity in the regulation of mitotic exit is underscored by the existence of a set of genes essential for this process, referred to as the "mitotic exit network (MEN)". They encode the GTP-binding protein Tem1 and its putative guanine nucleotide releasing factor Lte1, the dual specificity protein phosphatase Cdc14, protein kinases Cdc5, Cdc15, and Dbf2/Dbf20, the Dbf2-binding protein Mob1 (reviewed in ) and the spindle-pole-body component Nud1 . Conditional-lethal temperature sensitive (ts) mutations in any of the MEN genes cause cells to arrest in late mitosis with elevated mitotic Cdk activity when shifted to the restrictive temperature. Inactivation of Cdc28 by overexpression of Sic1 suppresses multiple MEN mutants and hyperactivation of Cdc28 by overexpression of Clb2 exacerbates their phenotypes, consistent with the idea that a key function of the MEN proteins is to eradicate Cdc28 activity during the transition from anaphase/telophase to G1 [6–9]. Recently, important advances have been made in our understanding of how the MEN is switched on during anaphase. Tem1 is thought to be kept inactive throughout early mitosis by the two-component GTPase-activating protein complex Bub2/Bfa1 which co-localizes with Tem1 at the spindle pole body [10, 11]. When the mitotic spindle penetrates the mother-daughter neck, the Tem1-bound spindle pole body is translocated into the daughter cell where a cortical pool of Lte1 is thought to activate Tem1 [12, 13]. In addition to this spatial regulation, the GTPase activity of Bfa1 is thought to be inactivated through its phosphorylation by Cdc5 , but it remains unknown how this process is coordinated with the presumed juxtaposition of Lte1 and Tem1 in the daughter cell. Despite this rapid progress in understanding the signals that regulate the MEN, the direct downstream targets of the MEN have yet to be apprehended. To address how the MEN components downstream of Cdc15 are organized and what their targets are, we sought tab (telophase arrest bypassed) mutants that alleviate the essential requirement for CDC15. In theory, tab mutants could act downstream of or parallel to CDC15, and could be either loss-of-function mutations in genes that inhibit exit from mitosis or gain-of-function mutations in genes that promote exit from mitosis. To our surprise, mutations in six linkage groups were uncovered, with three groups being recessive (tab1-tab3) and three groups being dominant (TAB5-7). We have shown in earlier studies that tab2-1 is a reduction-of-function mutation in NET1 (a.k.a. CFI1) [15–17] and that TAB6 is a gain-of-function mutation in CDC14. Net1 sequesters Cdc14 in the nucleolus and inactivates it in preanaphase cells. During exit from mitosis, a TEM1/CDC15-dependent signal frees Cdc14 from the nucleolus and allows it to promote inactivation of Clb/Cdc28 [15, 17, 19]. The fact that both Net1 and Cdc14 are directly involved in exit from mitosis validates the effectiveness of the tab screen and heightens the potential value of the uncharacterized tab mutants. Here, we present a detailed description of the tab mutant screen, and describe a third TAB gene, TAB1/MTR10. Transcription has been postulated to play an important role in triggering exit from mitosis . For example, Dbf2, a protein kinase that promotes exit from mitosis, is associated with the CCR4 transcription regulatory complex . In addition, the Swi5 transcription factor activates SIC1 expression during late anaphase, and both sic1Δ and swi5Δ are synthetically lethal with dbf2Δ[22, 7]. To address if production of new proteins is essential for exit from mitosis, we examined the effects of the protein synthesis inhibitor cycloheximide on Clb2 degradation, a key aspect of this process. Mutant cdc15-2 cells were uniformly arrested in late anaphase/telophase by incubation at the restrictive temperature 37°C. The cultures were then supplemented with 0, 10, or 100 μg/ml cycloheximide before being returned to 25°C to reverse the cdc15-2 arrest. In the absence of cycloheximide, Sic1 accumulated and Clb2 disappeared as cells exited mitosis (Figure 1, lanes 1–4). In the presence of cycloheximide, Sic1 accumulation was abolished, but Clb2 degradation still occurred with apparently normal kinetics (Figure 1, lanes 5–8 and 9–12). Although this result does not exclude the likely possibility that synthesis of new proteins (e.g. Sic1) normally facilitates the exit from mitosis, it reveals that a key aspect of mitotic exit – inactivation of Cdc28 protein kinase via degradation of the mitotic cyclin Clb2 – can proceed beyond the Cdc15-dependent step without synthesis of new proteins. Post-translational control of Clb2 proteolysis by CDC15. Exponentially growing cdc15-2 (RJD619) cells were arrested in late anaphase by shifting the culture to 37°C for three hours. The culture was split in three and either mock-treated (lanes 1–4) or supplemented with the protein synthesis inhibitor cycloheximide (CHX) at 10 μg/ml (lanes 5–8) or100 μ g/ml (lanes 9–12). After five minutes (time = 0), the cultures were released from cell cycle arrest by downshift to 25°C. At indicated time points, samples were withdrawn, and the levels of Clb2, Sic1 and Cdc28 proteins were assayed by SDS-PAGE and immunoblotting. To understand how the MEN mobilizes post-translational mechanisms to trigger mitotic exit, we conducted a genetic screen for 'telophase arrest bypassed' (tab) mutants that bypassed the essential requirement for CDC15 (Figure 2). Because the essential requirement for CLNs 1, 2, and 3 in entry into S phase can be bypassed by deletion of a gene (SIC1) that inhibits entry into S phase [23, 24], we reasoned by analogy that our screen might reveal key negative regulators of the anaphase/telophase -> G1 transition. Scheme for isolating telophase arrest bypassed (tab) mutants. See text for details. Ninety independent cultures of cdc15Δ [pMET3-cdc15-2, URA3] were first grown in inducing medium (- methionine) at permissive temperature (25°C) to allow occurrence of spontaneous mutations. The cultures were subsequently plated on repressing medium (+ methionine) at a temperature semi-restrictive for the cdc15-2 allele (30°C) to enrich for mutations that supported the growth of CDC15- deficient cells. 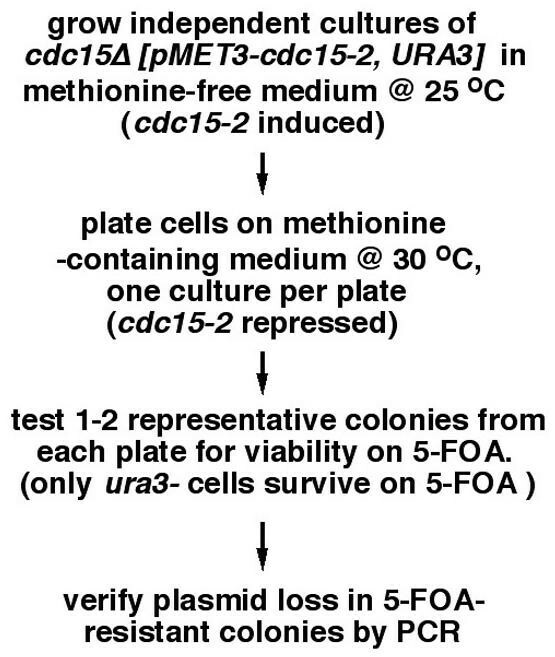 To identify mutations that allowed complete bypass of cdc15Δ, representative colonies from each plate were tested for their ability to grow on 5-FOA-containing medium (5-FOA selectively blocks the growth of plasmid-bearing URA3+ cells). The parental strain failed to grow due to its inability to proliferate without the [MET3-cdc15-2, URA3] plasmid. In contrast, twenty five mutants survived on 5-FOA. Furthermore, all of them had lost the plasmid as determined by PCR analysis (data not shown). Fifteen of these mutants were amenable to genetic manipulation and harbored single mutations. Fourteen mutants were assigned to three recessive and three semi-dominant/dominant linkage groups (Table 2). We referred to these mutants as tab mutants for their telophase-arrest-bypass (Tab+) phenotype. In addition, we serendipitously found that srp1-31 but not srp1-49 could bypass cdc15Δ (Table 2; data not shown). aWe have not determined if srp1-31 is allelic to tab3, TAB5, or TAB7.bAll alleles were tested for recessiveness/dominance of Tab+ except for TAB7-3.cSee Methods. dAll alleles of a single linkage group displayed similar ts growth phenotype. eAll strains were grown to exponential phase at 25°C, and subjected to indirect immunofluorescence using anti-Nop1 antibodies. The wild type staining pattern was scored as "+", and partial delocalization or fragmented staining patterns were scored as "-". Earlier studies identified tab2 and TAB6 as mutations in NET1 and CDC14, respectively [15, 18]. Net1 detains Cdc14 in the nucleolus and inactivates it until a Tem1-dependent signal sets Cdc14 free to promote exit from mitosis [15–17]. The fact that both Net1 and Cdc14 are directly involved in exit from mitosis prompted us to further analyze tab mutants. Does bypass of cdc15Δ require Sic1 accumulation and Clb2 degradation? Either Sic1 accumulation or Clb2 degradation is proposed to be sufficient to sustain mitotic exit . Although cdc15-2 mutants are defective in both processes, ectopic activation of either one should restore exit from mitosis and growth. Thus, to gain insight into their molecular targets, we asked if bypass of cdc15Δ by tab mutations required SIC1 or HCT1. Whereas all tab mutants tested were able to bypass cdc15Δ in the absence of HCT1 and two (net1 tab2-1 and CDC14 TAB6-1) were able to bypass cdc15Δ in the absence of either SIC1 or HCT1, four tab mutants (tab1-1, tab3-1, TAB5-1, and TAB7-1) failed to bypass in the absence of SIC1 (Table 3). Does bypass require SIC1 or HCT1? aTo assay if bypass required SIC1, cdc15Δ::TRP1 tab [pMET3-CDC15/URA3] cells were transformed with an SIC1-deletion cassette (S. pombe his5+ DNA fragment whose termini were engineered to be homologous to SIC1 5' and 3' untranslated regions). All transformants were tested for their ability to bypass cdc15Δ using the 5-FOA growth assay (sample size n = 4–17). They were also screened for the absence of SIC1 as the result of homologous integration. In the case of tab2 and TAB6, about half of sic1Δ transformants could bypass. This incomplete penetrance is not well understood. There are at least two sources of variability in this experiment. First, sic1Δ transformants of tab cdc15Δ [CDC15, URA3] were pregrown in rich media to accumulate cells that had lost the [CDC15, URA3] plasmid. Because plasmid-loss is a low-probability event and because cells without the plasmid are at a growth-disadvantage, the number of plasmid-free cells spotted on a 5-FOA plate probably was small and varied among different transformants. Second, mutant individuals can exhibit more variability than wild-type individuals, a phenomenon frequently observed in worms and flies. Therefore, it is possible that in only a fraction of plasmid-free cells, the amount of Cdc14 activity reached a level high enough to tolerate sic1Δ. Thus, one can imagine that for some transformants, the number of plasmid-free cells spotted on 5-FOA was small and that by chance they or their limited numbers of progeny could not exit mitosis, resulting in the absence of bypass colonies. In other transformants, the opposite could occur, giving rise to mixed results in the plate assay. bSimilar assay was conducted for HCT1. Sample size n = 1–7. cTransformants from a and b that resulted from non-homologous integration (and hence no deletion of SIC1 or HCT1) were used as a control. Sample size n = 12–86. We have previously shown that both net1 tab2-1 and CDC14 TAB6-1 efficiently bypassed the mitotic arrest caused by Tem1-depletion [15, 18]. Furthermore, bypass was accompanied by ectopic Sic1 accumulation and Clb2 degradation. Because both net1 tab2-1 and CDC14 TAB6-1 could bypass cdc15Δ in the absence of SIC1, we tested if the same bypass efficiency could be achieved by tab3-1, a SIC1-dependent bypass mutant. We used a tem1Δ::GAL1-UPL-TEM1 strain that allowed for conditional depletion of Tem1  to impose a conditional late mitotic block, and introduced the tab3-1 mutation into this background. Wild type or tab3-1 derivatives of tem1Δ::GAL1-UPL-TEM1 were grown in galactose medium (TEM1 induced), arrested in G1 with α factor, and released into glucose-containing medium to repress TEM1 expression (time 0). As expected, the majority (~80%) of TAB + cells arrested with large buds. In the tab3-1 strain, however, a significant fraction (~36%) of cells had ≥ 3 cell bodies at 12 hours after release, indicating that they had undergone at least one extra round of budding (Figure 3A). Thirty-six percent represents a minimum estimate of TEM1 bypass efficiency in tab3-1 cultures, since cells with 1–2 cell bodies could have arisen from bypass events followed by successful cell separation. tab3-1 enables TEM1-independent degradation ofClb2 and accumulation of Sic1. tem1Δ::GAL1-UPL-TEM1 tab3-1 (WY97) and tem1Δ::GAL1-UPL-TEM1 (WY46) cells grown in galactose medium (TEM1 expressed) at 25°C were arrested in G1 with α factor, and released into glucose medium (TEM1 repressed) at time = 0. (A) At indicated time points after release, budding index was monitored. (B) The experiment in (A) was repeated, except that at either 2 h (TAB3) or 3 h (tab3-1) following release from α factor arrest, α factor was added back to prevent cells from proceeding through a second cell cycle. At indicated time points, samples were withdrawn to measure Sic1 and Clb2 levels by SDS-PAGE and immunoblotting. Having established that tab3-1 indeed bypassed Tem1 deficiency at a cellular level, we tested whether Sic1 accumulation and Clb2 degradation, two hallmark events that accompany exit from mitosis, also occurred. tem1Δ::GAL1-UPL-TEM1 cells carrying TAB3 or tab3-1 alleles were arrested in G1 with α factor, and released into glucose medium (TEM1 repressed, time 0). After cells had exited G1, α factor was added back to stop cells from cycling beyond the next G1 phase. As Tem1-depleted TAB3 cells exited G1, Clb2 accumulated and remained at high levels, whereas Sic1 was degraded and remained at low levels (Figure 3B, left panels). In contrast, as Tem1-depleted tab3-1 cells progressed through mitosis, Clb2 was almost completely degraded and Sic1 accumulated to high levels (Figure 3B, right panels). These data suggest that like tab2-1 and TAB6-1, tab3-1 efficiently bypassed tem1Δ by enabling Tem1-independent degradation of Clb2 and accumulation of Sic1. We conclude that the apparent SIC1-dependence of bypass by tab3-1 and other tab mutants relates more to the strength of the particular mutation, rather than the mechanism of bypass. In support of this hypothesis, we recently observed that the SIC1-independent bypass mutant 15D2 is allelic to the SIC1-dependent tab1-1 mutant (R. Azzam, unpublished data). All MEN genes are required for exit from mitosis, but it has not yet been tested whether this is the sole essential function of all MEN genes, or if some MEN genes play critical roles in other processes. This question is amplified by the observations that Cdc5 participates in both chromosome segregation and cytokinesis ([25, 26]; Park et al., submitted), Mob1 binds an essential protein kinase involved in spindle pole body duplication , and Tem1, Cdc15, Dbf2, and Mob1 have all been implicated in cytokinesis ([28–31]; reviewed in . The tab mutants provide a unique opportunity to address this issue. Accordingly, we tested if net1 tab2-1 could bypass deletion mutants of other MEN genes. net1 tab2-1 bypassed cdc15Δ, tem1Δ, dbf2Δ dbf20Δ, mob1Δ, but not cdc14Δ (Figure 4A; ). In addition, it bypassed cdc5Δ with negligible (1000–10,000 fold lower) efficiency (Fig. 4A), suggesting that although the sole essential function of CDC15, TEM1, DBF2, and MOB1 is to drive cells out of mitosis, CDC5 has other critical cellular functions. 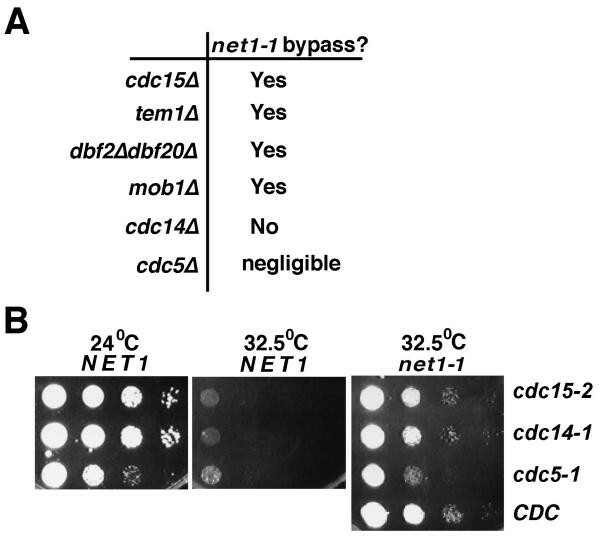 net1tab2-1 efficiently bypasses multiple deletion mutants of MEN and extends the permissive temperature range for cdc15-2, cdc14-1, and cdc5-1. (A) The bypass specificity of net1tab2-1 (net1-1). (B) Cells with specified combinations of NET1 alleles (indicated at the top) and CDC alleles (indicated on the side) were spotted onto YPD plates in 5-fold serial dilutions. Plates were incubated at 24° (left panel) or 32.5° (center and right panels) for 2–4 days before being photographed. net1tab2-1 was observed to suppress the ts phenotype of dbf2-1 at 35.5°C (not shown). To further characterize the tab mutants, we tested whether they display other phenotypes in an otherwise wild type background. tab mutants grown to exponential phase at 25°C and shifted to 37°C for 3 or 6 hours did not arrest at a particular stage of the cell cycle (data not shown). When tab mutants were plated on YPD plates and grown at 37°C, TAB5 and TAB7 grew normally (Table 2), suggesting that bypass of CDC15 does not necessarily cause defective growth. However, tab1 failed to form colonies, and net1 tab2-1 , tab3, and CDC14 TAB6-1 grew slowly at 37°C, suggesting that at least some tab mutations reside in genes that have multiple functions. Indeed, NET1 additionally modulates nucleolar structure and transcription [16, 18]. The release of Cdc14 from nucleolar Net1 promotes mitotic exit [15, 17, 18]. net1 tab2-1 cells display a panel of nucleolar defects including reduction of nucleolar silencing, mislocalization of nucleolar antigens, alteration of rDNA morphology, and reduction of rRNA synthesis [16, 18]. To test whether perturbation of nucleolar structure is consistently associated with bypass of cdc15Δ, we immunolocalized the nucleolar antigen Nop1 in all tab mutants. Nop1 localization was also perturbed in tab1-1 and srp1-31, but was normal in tab3, TAB5, TAB6, and TAB7 cells (Table 2; ), suggesting that a gross change in nucleolar structure is not required for bypass. Because the putative Tem1 antagonists and mitotic checkpoint proteins Bub2 and Bfa1 negatively regulate exit from mitosis and cytokinesis in response to both DNA damage and spindle misorientation (; reviewed in ), we asked whether bypass of TEM1-dependent regulation can cause chromosome instability. All tab mutants are in the W303 background in which the ade2-1 mutation makes colonies red after adenine in the growth medium has been depleted. A URA3-marked tester mini-chromosome carrying the SUP11 suppressor transfer RNA gene ) was introduced into net1 tab2-1 and CDC14 TAB6-1, the two tab mutants with well-characterized bypass mechanisms. Cells that retain the mini-chromosome should form white colonies due to suppression of ade2-1 by SUP11, whereas loss of this chromosome should result in a red sector or sectors. The extent of chromosome loss (expressed as % colonies that were red or had red sectors) was low in wild-type and CDC14 TAB6-1 cells (< 5%), and high (94%) in net1 tab2-1 cells (Figure 5). In comparison, in a strain lacking the anaphase-inhibitor Pds1, ~18% of the colonies suffered chromosome loss events (Figure 5). Since net1 tab2-1but not CDC14 TAB6-1 also perturbs nucleolar functions , CDC14 TAB6-1 is a more specific and representative bypass mutant. Thus, TEM1 regulation can be short-circuited without a major effect on chromosome loss. Consistent with this notion, cells lacking Bub2 (an inhibitor of Tem1) showed a similarly moderate extent of chromosome loss (5%) (Figure 5). We propose that additional functions of Net1 ensure faithful transmission of chromosomes. net1tab2-1 cells display strong chromosomal segregation defect. A URA3-marked tester mini-chromosome carrying the SUP11 suppressor transfer RNA gene  was introduced into the indicated genetic background also harboring an ade2 mutation. Cells that retained the mini-chromosome would form white colonies due to suppression of ade2 by SUP11; the loss of this chromosome resulted in a red sector or sectors. When the loss event occurred at a very high frequency, a red colony could form. Cells were pre-grown in the uracil-lacking SD agar medium, and plated on YPD plates at room temperature. (A) After the initial signs of colony coloration appeared, the plates were kept at 4°C to enhance color development. White arrowheads indicate three sectoring events in a net1tab2-1(net1-1) colony. (B) Percentages of colonies that were red or had red sectors were calculated. We attempted to clone by complementation genes corresponding to the recessive tab mutations by exploiting the fact that all of the recessive tab mutants are ts for growth (see below). By this approach, TAB1 was revealed to be MTR10, a gene previously implicated in nuclear transport [35–37]. We were unable to isolate plasmids that complemented tab3 in all libraries tested. Both MTR10 (TAB1) and SRP1 belong to the nuclear transport receptor/adaptor family (reviewed by ). Mutant srp1-31 and mtr10 tab1-1 cells accumulate the ribosomal protein Rpb11b in the nucleus . Thus, to evaluate a potential link between nuclear transport and the tab phenotype, we evaluated the localization of Rpl11b-GFP  in all tab mutants. Mutants expressing Rpl11b-GFP were grown to early-log phase at 25°C, shifted to 37°C to induce the ts mutant phenotype (which also reduces synthesis of ribosomal proteins including Rpl11b), and shifted back to 25°C to induce new ribosomal protein synthesis. If the rate of mutant phenotype reversal is slower than restoration of ribosome synthesis, then Rpl11b should accumulate in the nucleus. Whereas Rpl11b-GFP was distributed relatively evenly in wild-type cells, it accumulated in the nucleus in a significant fraction of srp1-31 and net1 tab2-1 cells at 25°C and after 25°C ->37°C -> 25°C shift (Figure 6; ). In addition, although mtr10 tab1-1 cells were relatively normal at 25°C, 30% of them accumulated nuclear Rpl11b after 25°C ->37°C -> 25°C shift (Figure 6). 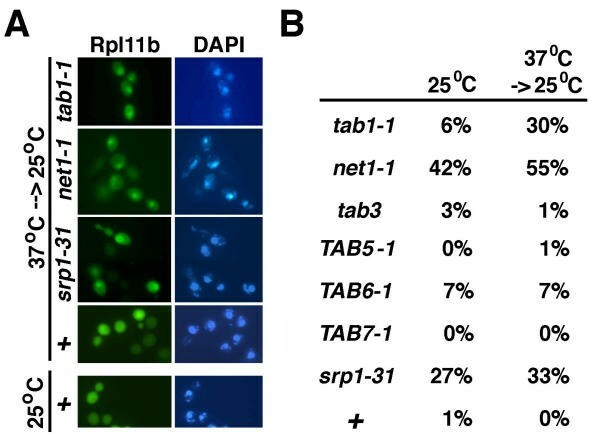 Thus, multiple tab mutants accumulate Rpl11b in the nucleus, implying that nucleocytoplasmic trafficking is involved in the regulation of mitotic exit. Other tab mutants (such as tab3, TAB5, CDC14 TAB6 and TAB7) showed no defect in this assay, suggesting that bypass of cdc15Δ can be achieved without perturbing nucleocytoplasmic transport. Some of the tab mutants show nuclear transport defects. Strains of the indicated genetic background were transformed with a CEN/ARS plasmid expressing Rpl11b-GFP, and grown at 25°C. A portion of the cultures were then shifted to 37°C for 1 hr and shifted back to 25°C for 35 min before the 37°C -> 25°C samples were taken. (A) Rpl11 b-GFP was visualized as described previously . (B) The percentage of cells (+/- 1%) with preferential nuclear Rpl11b-GFP staining in each sample was counted (n ≥ 100). Both transcriptional and post-translational controls have been implicated in the operation of the Mitotic Exit Network and the regulation of the anaphase/telophase -> G1 transition [40, 7, 19, 41]. To address whether the portion of the MEN that acts downstream of CDC15 can trigger a key aspect of the anaphase/telophase -> G1 transition (i.e. inactivation of Clb/Cdc28 via proteolysis of Clb2) in the absence of new gene expression, we evaluated the turnover of Clb2 in cells released from a cdc15-2 arrest in the presence of cycloheximide. Interestingly, Clb2 was rapidly and efficiently degraded upon reversal of the cdc15-2 block regardless of whether cycloheximide was present (Figure 1) although both cytokinesis and cell separation require protein synthesis . This observation suggests that the exit from mitosis in budding yeast may be controlled by mechanisms fundamentally similar to those employed by animal cells, which proceed through mitosis with highly condensed, transcriptionally silent chromosomes. Interestingly, all of the MEN genes have putative homologues in the C. elegans genome http://genome-www.stanford.edu/Saccharomyces/worm/. A deliberate search for bypass mutants was a key aspect of the screen reported here, since numerous genetic interactions have been observed among components of the MEN (consult  for a summary). Formally speaking, it is not possible to order gene functions based on suppressive interactions involving reduction-of-function (e.g. ts) alleles. For example, the net1-1 allele suppressed ts mutations in both its downstream target CDC14 and its upstream regulators CDC5, CDC15, and DBF2 (Figure 4B). Since we sought mutants that bypassed cdc15Δ, the tab genes are predicted to function either downstream of or parallel to CDC15, but not upstream of CDC15. The tab screen yielded both dominant and recessive mutants which mapped to six linkage groups. The pattern of alleles (Table 2) does not satisfy a Poisson distribution, suggesting that the screen has not reached saturation. The recessive tab mutants are likely to represent reduction-of-function mutations in genes that inhibit exit from mitosis, and the dominant TAB mutants are likely to result from gain-of-function mutations in genes that promote exit from mitosis. This prediction is supported by our prior characterization of the tab2-1 and TAB6-1 alleles of NET1 and CDC14, respectively (see next section). The fact that we recovered recessive, semi-dominant, and dominant mutants in additional tab genes suggests that there are likely to be multiple dosage-sensitive positive and negative regulatory controls that act downstream of or parallel to CDC15. tab mutants can be classified into two groups: those that bypass cdc15Δ only in the presence of SIC1 (e.g. tab3-1), and those that can bypass in the absence of SIC1 (e.g. net1tab2-1 and CDC14TAB6-1). It remains unclear whether mutants distribute into these classes based on bypass mechanism or allelic potency, but we favor the latter possibility, because some tab1 alleles required SIC1 to bypass cdc15Δ, whereas others did not (R. Azzam, unpublished data). 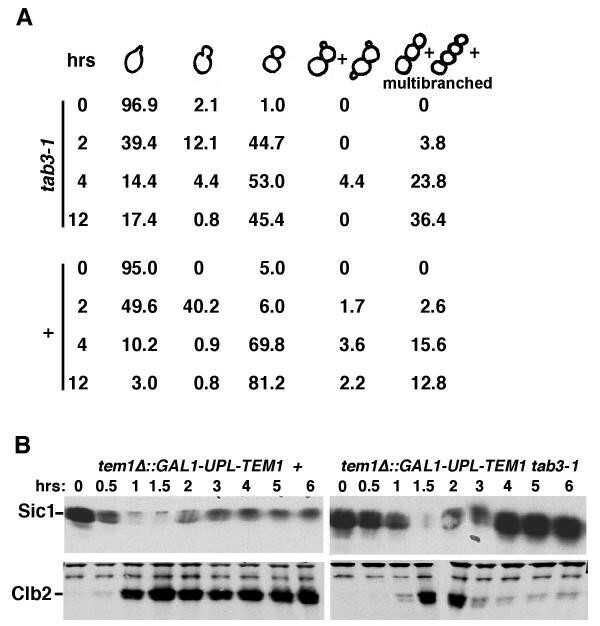 Importantly, tab mutants from both classes appeared to bypass mitotic arrest in Tem1-depleted cells by enabling degradation of Clb2 and accumulation of Sic1 – two hall-marks of mitotic exit (Figure 3; [15, 18]). Biochemical and cell biological experiments indicate that Net1 acts as part of a complex named RENT that tethers Cdc14 to the nucleolus and inhibits Cdc14 phosphatase activity, and that CDC15 and TEM1 are required for the release of Cdc14 from Net1 at the end of mitosis [15–17, 43]. Consistent with this notion, both net1 tab2-1 (which encodes a mutant version of Net1 with presumably reduced affinity for Cdc14) and CDC14 TAB6-1 (which encodes a mutant version of Cdc14 with reduced affinity for Tab2/Net1) bypass cdc15Δ[15, 18]. Both net1 tab2-1 and CDC14 TAB6-1 impinge directly on mitotic exit, suggesting that other TAB genes may encode physiological regulators and effectors of the Mitotic Exit Network. The net1 tab2-1 mutation efficiently bypassed tem1Δ, cdc15Δ, dbf2Δdbf20Δ, and mob1Δ, consistent with the notion that the sole essential function of all these genes is to inhibit Net1. net1 tab2-1 failed to bypass cdc14Δ, because Cdc14 is the downstream target of Net1 [15, 17]. Cdc5 also regulates Net1 (Shou et al., manuscript in preparation), but net1 tab2-1 bypassed cdc5Δ with very low efficiency, presumably because CDC5 has other essential functions [44, 25, 26, 45]. The most parsimonious model that unifies all of these observations is as follows: Tem1 functions upstream of Cdc15, which in turn activates the Dbf2-Mob1 protein kinase complex [46–49]. Together with Cdc5, these proteins dislodge Cdc14 from nucleolar Net1. Cdc14 subsequently dephosphorylates (and thereby activates) proteins involved in Sic1 expression (Swi5) and C1b degradation (Hct1/Cdh1) [19, 41, 50], thereby eliminating mitotic Cdk activity and promoting exit from mitosis. The mechanisms by which Cdc5 and Dbf2/Mob1 promote the disassembly of RENT remain unknown, raising the possibility that other Tab proteins serve as intermediaries in this process. One attractive hypothesis based on our identification of MTR10 as a tab gene is that MEN proteins regulate the nucleocytoplasmic distribution of a key regulator of the release process. The Bub2/Bfa1 GTPase-activating protein (GAP) complex inhibits the MEN and cytokinesis in response to DNA damage and spindle misorientation (; reviewed in ). bub2Δ and CDC14 TAB6-1 cells show similar chromosome instability as wild-type cells. 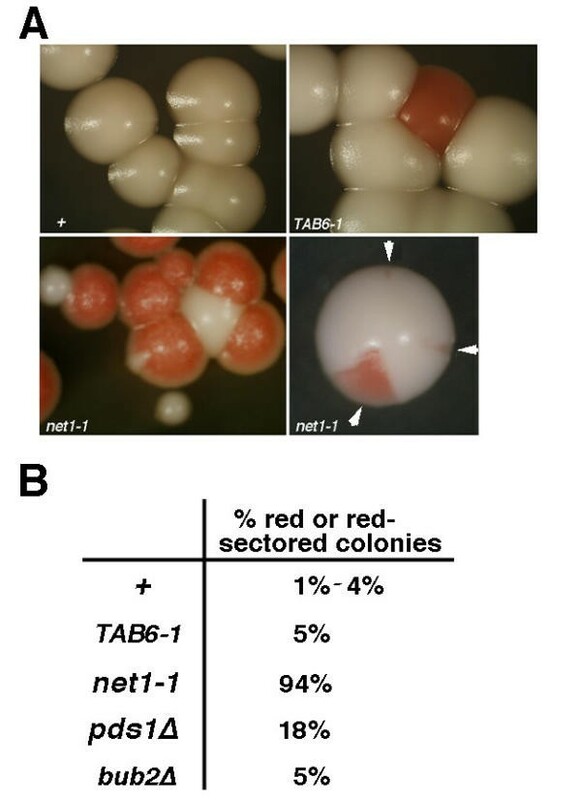 In contrast, net1 tab2-1 cells have a dramatic chromosome instability phenotype, with some colonies showing multiple red sectors indicative of multiple chromosome-loss events, and many colonies completely red on the surface (Figure 5A). Net1 is unlikely to directly regulate transmission of the tester chromosome, because it is only localized to rDNA in the nucleolus [15–17]. Thus, the difference between net1 tab2-1 and CDC14 TAB6-1 presumably results from molecular defects unique to the former mutant, including defective nucleolar structure and function, or perhaps defective nuclear transport (; Figure 6). Further study is required to reveal how the multifunctional Net1 protein helps to ensure chromosome transmission fidelity. Nuclear transport-defective mutations in MTR10 and SRP1 (mtr10 tab1-1 and srp1-31, respectively) bypassed cdc15Δ. Mtr10 assembles with and functions as a nuclear import receptor for the mRNA-binding protein Npl3 [36, 37]. Interestingly, srp1-31 also inhibits nuclear import of multiple proteins including Npl3 [51, 52]. Remarkably, reduction-of-function alleles of the karyopherin KAP104 were also recovered in a screen for mutations that suppressed cdc15-2 ts (A. Toh-e, personal communication). KAP104 is required for proper localization of mRNA binding proteins Nab2 and Hrp1 to the nucleus . The only phenotype known to be shared by srp1, mtr10, and kap104 mutants is accumulation of the 60S ribosomal protein Rpl11b in the nucleus . SRP1, MTR10, and KAP104 may also collaborate to maintain the proper nucleocytoplasmic partitioning of α factor (or factors) that regulates mitotic exit. An alternative possibility is that they sequester an inactive stockpile of α factor that, upon mutation or signalling by the MEN, is released from these transportins and enables exit from mitosis [54, 55]. Finally, it is possible that the transportin mutants enable bypass through an indirect perturbation of nucleolar architecture (Table 2). Given that some of the MEN proteins reside in the cytoplasm whereas their target – the RENT complex – resides in the nucleolus, it is tempting to speculate that nuclear transport is a target of MEN action. Our failure to observe nuclear accumulation of Rpl11b in tab3 and TAB5-TAB7 mutants suggests that these tab genes bypassed cdc15Δ by a distinct mechanism. Regardless of the exact mechanisms of bypass, it is clear from these analyses that the release of Cdc14 from Net1 is more intricately connected to cell regulation than was previously imagined. Three main conclusions on how exit from mitosis is regulated in the budding yeast can be derived. First, the sole essential function of the Tem1, Cdc15, Dbf2/Dbf20, and Mob1 (but not Cdc5) proteins are to promote the release of Cdc14 from the nucleolus, as cells lacking these proteins can grow upon simultaneous reduction of NET1 activity. Second, high chromosome loss rate was observed in net1 tab2-1 but not CDC14 TAB6-1, suggesting that although CDC15-independent mitotic exit does not dramatically affect chromosome transmission, additional functions of Net1 do. Third, both mtr10 tab1-1 and srp1-31 affect nuclear transport, suggesting that nuclear transport regulates mitotic exit. All yeast strains used in this study (listed in Table 1) are isogenic to W303. Standard methods were employed for the culturing and manipulation of yeast . All plasmid constructions were based on the pRS vector series . To replace CDC15 with TRP1, polymerase chain reaction (PCR) products containing TRP1 flanked by 200-base pair (bp) homology to the 5' and 3' untranslated regions of the targeted gene were used to transform diploid strain RJD381. Correct integrants were verified by PCR using primers that amplified a DNA fragment that spanned the recombination junction. Deletions of CDC5 and TEM1 were carried out similarly. To construct [pMET3-CDC15, URA3] (pWS100) and [pMET3-cdc15-2, URA3] (pWS109), the corresponding genes (from start codon to 300 bps downstream of the stop codon) were amplified by PCR from genomic DNA of wild type (RJD381) or cdc15-2 (RJD619) cells, and cloned into the SpeI and SacII sites of RDB620 (a derivative of pRS316 containing the MET3 promoter inserted between the HindIII and EcoRI sites). "All strains are in the W303 background (ade2-1 can1-100 his3-11-15 leu2-3-112 trp1-1 ura3-1), which was provided by B. Fuller. [ ] indicates CEN/ARS plasmid. WY280 and WY288 were derived after backcrossing the original strains into W303 three times. The scheme is outlined in Figure 2. Ninety independent cultures of cdc15Δ [pMET3-cdc15-2, URA3] (WY221) were grown at 25°C in synthetic minimal medium + 2% glucose (SD) in the absence of methionine. For each culture, ~8 × 106 cells were plated on SD+ methionine (2 mM) at 30°C (to simultaneously repress expression and partially inactivate the cdc15-2 allele). One to two colonies were picked from each plate and tested for viability on SD+ 5-fluoroorotic acid (5-FOA) plates . When more than one colony was picked from a single plate, care was taken to pick colonies of different size or morphology. Out of ~90 colonies tested, 25 survived on 5-FOA medium (Tab+). PCR analysis confirmed that all twenty five colonies had lost the [pMET3-cdc15-2, URA3] plasmid, indicating that they were true bypassers of cdc15Δ. To determine if Tab+ phenotypes were due to single mutations, cdc15Δ tab strains were crossed to cdc15Δ [pMET3-cdc15-2, URA3] and the resulting diploids were sporulated and dissected. Approximately 50% of the viable spores should bypass cdc15Δ (as indicated by 5-FOA resistance) if the Tab+ phenotype was due to a single mutation. Out of twenty five mutants, fifteen satisfied this criterion, and the other ten were discarded because they either failed to sporulate, or yielded few viable spores after dissection, or did not segregate as single mutations. The same crosses were also used to determine if Tab+ was recessive or dominant: for every tab mutant, haploid cdc15Δ tab [pMET3-cdcl5-2, URA3] and diploid cdc15Δ/cdc15Δ tab/+ [pMET3-cdc15-2, URA3] cells were pre-grown on YPD (1% yeast extract/2% peptone + 2% glucose) at 25°C for 2–3 days, spotted in 5-fold serial dilutions onto SD+5-FOA plates, and the number of 5-FOA resistant colonies from the diploid was divided by that from the haploid to obtain ratio P. The mutant was defined to be dominant if P= 0.1-1, semi-dominant if P= 0.01-0.1, and recessive if P < 0.01. To introduce tab mutations into the wild type background, cdc15Δ tab strains were crossed to CDC15 TAB, and tab spores were verified by crossing to cdc15Δ [pMET3-CDC15, URA3], and demonstrating that half of the resulting cdc15Δ segregants were 5-FOA resistant. All cdc15Δ tab mutants were also crossed to strains harboring either [pMET3-CDC15, URA3] [pRS313, HIS3] or [pMET3-CDC15, URA3] [pRS315, LEU2] to introduce these plasmids. The resulting strains grew better than the original cdc15Δ tab strains, and harbored selectable markers that facilitated subsequent crosses. To test whether net1 tab2-1 can bypass tem1Δ, dbf2Δ dbf20Δ, mob1Δ, cdc14Δ, and cdc5Δ, we crossed net1 tab2-1 (WY39) to WY218, WY280, WY288, WY243, and WY214, respectively. The diploids were sporulated, and if ~50% of the MEN-deleted spores were resistant to 5-FOA, then net1-1 could bypass the MEN null mutation. To test temperature sensitivity (ts) of tab mutants, cells were spotted or streaked onto YPD plates, and incubated at 37°C. Their growth was scored after one to two days. Nop1 immunolocalization was performed as described earlier . 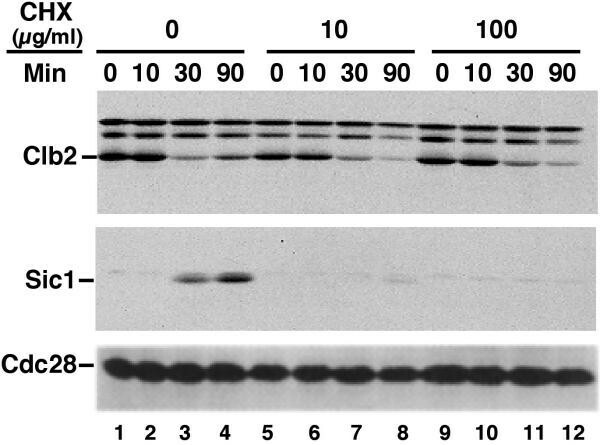 The chromosome loss assay was carried out using a strain  backcrossed into the W303 background by F. Uhlmann. When cells were pre-grown in YPD liquid (instead of SD-URA solid) media before being tested on YPD plates, the percentage of colonies that were red or had red sectors remained similar for wild-type, CDC14 TAB6-1 , and bub2Δ strains, but was ~25% for net1 tab2-1. This number was lower than the 94% value observed in Figure 5, but still significantly higher than the wild-type value (< 5%). To assign tab mutants to linkage groups, cdc15Δ tab [pMET3-CDC15, URA3] strains were crossed against each other, and the diploids were sporulated and dissected. If two tab mutations belonged to the same linkage group, then all spores were expected to survive on 5-FOA. Otherwise, approximately one quarter of the spores would fail to bypass cdc15Δ. The alleles of TAB2, TAB3, TAB5, TAB6, and TAB7 (see Table 2) were assigned this way. The recessive tab mutants exhibited a ts growth phenotype that co-segregated with the Tab+ phenotype. Complementation tests were used to assign two of the ts mutations as alleles of tab 1. After TAB1 was shown to be MTR10, other tab1 alleles were ascertained by their linkage to the MTR10 locus. To clone TAB1 and TAB2, tab1-1 and tab2-1 mutant strains were transformed with plasmid libraries harboring yeast genomic DNA fragments, and incubated at 25°C for one day before being shifted to 37°C . Libraries constructed by the laboratories of P. Heiter (ATCC#77164) and R. Young  rescued tab1-1, and a 2μ library (ATCC#37323, ) rescued tab2-1. Transformants (enough to cover multiple genome equivalents) were screened, and plasmids retrieved from colonies that grew at 37°C were re-transformed into the original mutant strain to verify their complementation activity. Candidate plasmids were sequenced, and the genomic regions containing the complementing activity were identified. TAB1 resided on Chromosome XV, 631,500–637,950, and TAB2, on Chromosome X, 291,900–299,466. To confirm that these genomic fragments indeed carried the TAB genes, complementing fragments were cloned into the integrating vector [pRS305, LEU2], and linearized to target integration into the tab locus in a cdc15Δ::TRP1 tab [pMET3-CDC15, URA3] strain. The transformants lost their Tab+ phenotype, and when crossed to cdc15Δ::TRP1 [pMET3-CDC15, URA3], the diploid yielded no spores that could bypass cdc15Δ (n = 40–50). Since both genomic fragments contained multiple open reading frames (ORFs), each ORF was amplified by PCR from yeast genomic DNA and cloned into the integrating plasmid pRS305. The resulting plasmids were transformed into cdc15Δ::TRP1 tab [pMET3-CDC15, URA3] to identify the ORF that reversed the Tab+ phenotype. This analysis revealed TAB1 to be MTR10, and TAB2 to be YJL076W (NET1). For gene replacement, the Schizosaccharomyces. pombe his5 + PCR amplification/ transformation method was used . Correct integrants were verified by PCR using primers that amplified a DNA fragment that spanned the recombination junction. To assay if SIC1 or HCT1 was required for the Tab+ phenotype of tab mutants, SIC1 or HCT1 was replaced by his5 + in cdc15Δ::TRP1 tab [pMET3-CDC15, URA3] strains. Each transformant was assayed for the occurrence of correct integration and its ability to survive on 5-FOA. Cells were grown in 1% yeast extract/ 2% peptone (YP) with 2% glucose (YPD), 2% galactose (YPG), or 2% raffinose (YPR). For the experiment described in Figure 1, cdc15-2 (RJD 619) cells were grown to exponential phase in YPD at 25°C, and shifted to 37°C for three hours so that >95% cells were arrested as large-budded cells. Cycloheximide (CHX) was supplemented to a final concentration of 0, 10, or 100 μg/ml to inhibit translation, and α factor (10 μg/ml) was added to trap cells in the subsequent Gl phase. After five minutes, the cultures were released to 25°C at time 0. Samples were taken at various time points after release. The experiment in Figure 3 was carried out as previously described . Detection of proteins from crude yeast extracts was as described . The following primary antibodies were used in immunoblotting: anti-Sic1 (1:8000), anti-Clb2 (1:2500), anti-Cdc28 (1:3000), and 12CA5 (directed against the haemagglutinin (HA) epitope; 1:1000, with 0.5 M NaCl). The first three antibodies were raised in rabbits and affinity purified, and the last one was from mouse. Special thanks go to Ramzi Azzam for mapping the putative "tab4" mutation to the tab1 linkage group (Table 2) and Kathleen Sakamoto for performing the Nop1 immunofluorescence experiment (Table 2). We thank R. Azzam, K. Sakamoto, M. Budd, R. Feldman, B. Hay, P. Sternberg, and R. Verma for discussions; H. Mountain, P. Philippsen, A. Varshavsky, B. Futcher, and P. Silver for pMET3, S. pombe his5 +, UPL, HA3, and RPL11B-GFP plasmids, respectively; F. Uhlmann and H. Rao for the SUP11/URA3 sectoring strain; M. Nomura, L. Johnston, and F. Luca for srp1, dbf2Δdbf20Δ [pRS316-DBF2], and mob1Δ [pRS316-MOB1] strains, respectively; C. Thompson for yeast genomic library, and D. Kellogg, R. Feldman, and J. Aris for anti-Clb2, anti-Sic1, and anti-Nop1, respectively. W.S. was a Howard Hughes Medical Institute predoctoral fellow.